Everyone else seems to be posting about Charlie Hebdo, so I may as well take a stab at it. There is a lot of hand-wringing in the West over whether Charlie Hebdo's offensiveness provoked the attack on its offices. This seems to ignore the fact that the majority of terror victims world-wide do not run satirical journals. 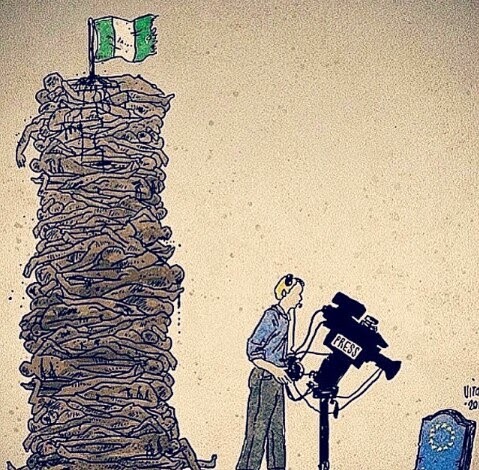 Baga, Nigeria and Charlie Hebdo were attacked contemporaneously and there has also been a lot of angst about coverage of Boko Haram's massacre lagging Charlie Hebdo. (It's like some people are being paid by the word.) Before we assume journalistic bias, let us recognise that the demand apparently matches supply. The ignorance thus appears wilful, and there's no point selling news if no one's buying it. So why do we care more about twelve Parisians than scores of rural Nigerians? Perhaps the following table will help. Furthermore, the Baga victims are a fraction of the thousands likely to be killed by terror attacks in Nigeria this year. In contrast, rich western countries can go years without any deaths due to terrorism. If you're looking for causes, then prima facie baby-boomer cartoonists attract far less terror attacks than ethnic Muslim sharecroppers. Because it is disproportionate, this seemingly self-reinforcing, introspective analysis says more about Western anxiety than the actions of the French victims. We/Westerners/White People can't accept that we did not contribute to our own fates, while at the same time being perfectly okay with thousands of people in developing countries simply being in the wrong place at the wrong time. The Enlightenment was supposed to make the West a beacon of cause-and-effect self-determination, damn it! The danger of narrowly viewing terrorism as a national or cultural problem is that we may miss solutions that transcend culture, language, and nations. A dollar to aid Nigeria may prevent more terrorists than thousands of euros on CCTVs in Paris. But if we are all victims of the terrorists' war on culture, then who is to say where that culture's borders lie? And if we do not know our cultural borders, how are we to defend them? Assuming a uniquely Western 'cause' for the Charlie Hebdo attack distances us not only from the terrorists, but from other terror victims we're too cool to hang out with. (They didn't tweet their village being destroyed so, like, did it even happen?) We cannot all be Charlie Hebdo.